Bio: Peter Thomas was born in 1953. Educated at Uppingham School, he studied sculpture and printmaking for his BA degree at Kingston. After taking an Art Teachers’ Certificate course at Brighton he became artist in residence at Felsted School, then taught Art and Design at Uppingham until, in 1981 he moved to the Dordogne. In 2001, he was awarded the title of ‘Maître Pastelliste de France’ having been elected a member of the Société des Pastellistes de France only the previous year. 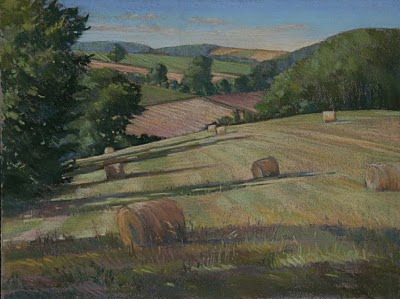 Peter has exhibited regularly with the Société des Pastellistes de France including the Festival International du Pastel at Feytiat near Limoges held every summer, where he also teaches some Master Classes with the Société during the summer months. Subjects: Landscape. Peter attaches great importance to working 'on site' so as to catch the changing light and essential character of place. Gallery: Two main galleries, Archives, with sub-galleries France, Spain, Italy, British Isles, Others; and Gallery, with sub-galleries France, Spain, British Isles. Image View: Each gallery page contains thumbnails with data on size; in Archives these may not be enlarged. I found these pages very slow to load. In Gallery, thumbnails enlarge in same frame and may be downloaded. If you are tempted to click on the link “more about this pastel”, you get an email invitation, not further details there and then. If you click on the sub-gallery headings, rather than on Gallery itself, the same thumbnails are displayed, but at a larger size, and with title and dimension displayed. Use the back button on your PC to return to previous page. File size can be up to a full megabyte, depending on image! UPDATE: In the June 2013 issue of the Pastel Journal published an in-depth piece on this artist; see below for full article.